1899 January 1st 1899 It was late when we got up this morning and after doing up the work went up to the cemetery It was a very cold forenoon. We all but Lee ate dinner down at Otts. Will and I started home early in the afternoon. We had things all put away and supper ready by six oclock. I read in the evening. What I wonder is in store for us this year Monday January 2d 1899 It was more moderate. Will helped me wash and as the clothes got dry I ironed them in the afternoon I dressed chicken and did other work. The boys were getting up wood. Tuesday January 3d 1899 It was a nice day. Elmer & Ida with Hart and [Ossie] were down to spend the day. We enjoyed to have them very much. I read and worked in the evening. 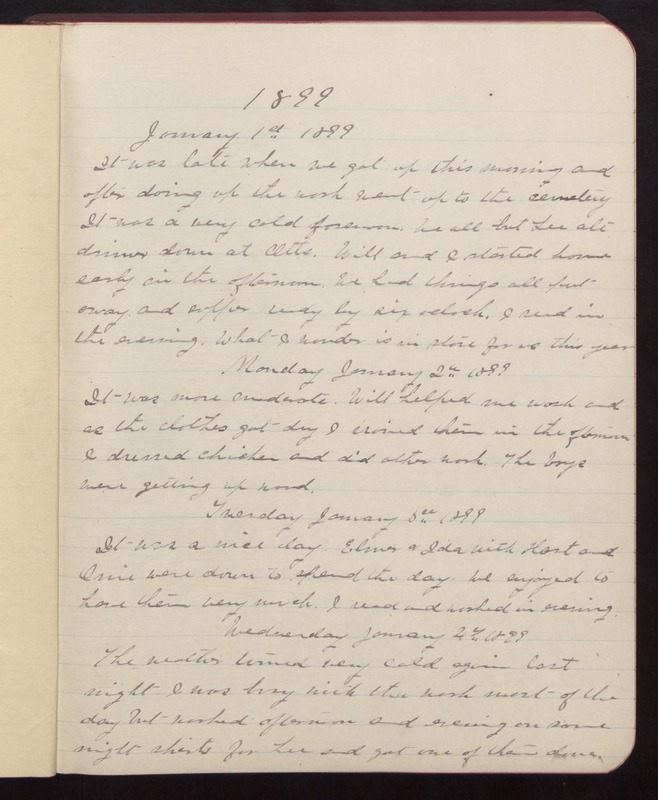 Wednesday January 4 1899 The weather turned very cold again last night. I was busy with the work most of the day but worked afternoon and evening on some night shirts for Lee and got one of them done.